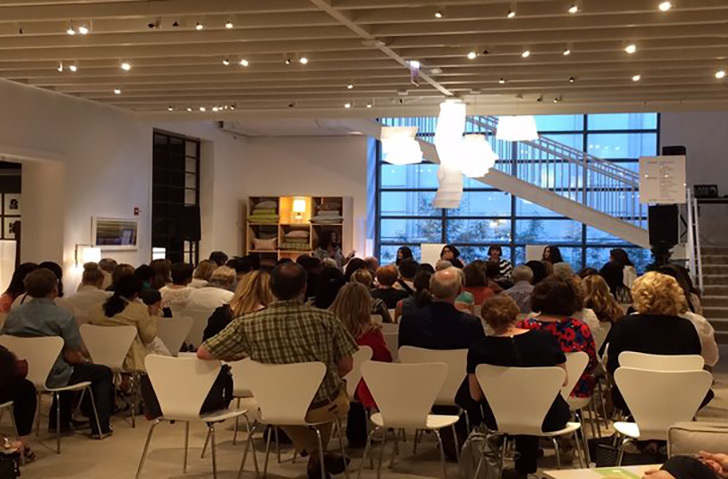 Each panelist at our Discover Modern Inspiration: Living With Color event sat clutching a pillow. Comfortable, casual and colorful, each pillow showcased the personality of the person holding it; a “spirit pillow” as referred to by Sophie Donelson, editor-in-chief of House Beautiful and the moderator of the evening. 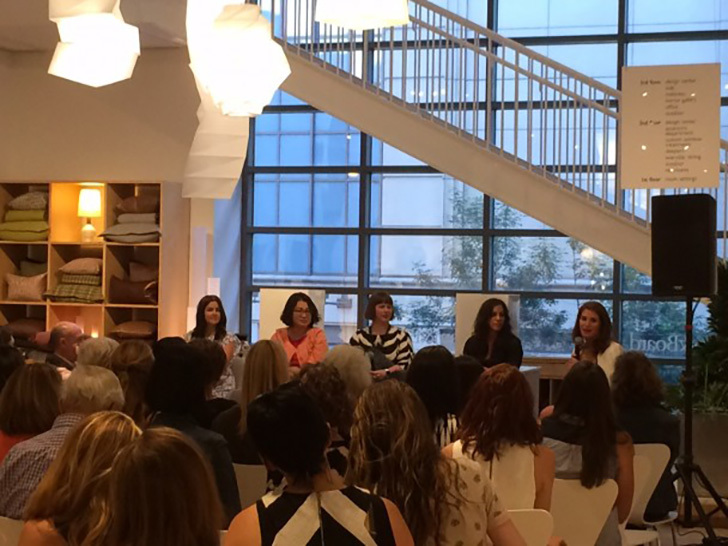 The lively event was hosted at our downtown Chicago store last week, in partnership with House Beautiful and Valspar. Sophie encouraged the panel of design and color experts to find a pillow that spoke to color and design inspiration, creating a conversation as unique as the experts themselves. The pillows were the perfect prompt for Chicago-based panelist Alexandra Kaehler, a House Beautiful Next Wave Designer. She said if you’re looking to add color to your home but have concerns about a paint commitment, throwing some hue-heavy pillows into the space can work wonders. Adding artwork is another great color alternative to paint. Including small accent pieces allows you to “embrace what appeals to you at the moment,” said Janel Laban, executive editor of Apartment Therapy. The beauty of your living space is that it can display what you love at a specific point in time and is indicative of your lifestyle. But when you’re ready for a more fixed color solution, the panelists weighed in on how to choose your paint. Do you want this room to soothe you? Energize you? How do you want your guests to feel upon seeing the color? What else are you going to integrate into the room that needs consideration? Do you have accent pieces and colorful furniture in this space? How will those pieces interact with the color you choose? How can the paint color and additional pieces balance each other out? Deb Sonzo, Visual Associate for Room & Board, agreed with other panelists that you can transform outdated wood cabinetry or floors by painting over them. It’s just as easy to paint over wood as it is over walls, and it completely changes the feeling of a space. Sophie also echoed that painting over brick is simple, too. “Not all brick is created equal,” she said, reminding us that some brick is better looking with a paint touch-up. “White walls manipulate the other colors in the room,” said Janel. Though white can seem stark, bringing in colorful accessories makes the walls an ideal canvas to facilitate the personality of a space, which is why we’re so drawn to them. Sue then gave a thoughtful counterpoint reminding us, “The home is not a museum. It’s an evolution.” And it’s perfectly okay (and real life!) to live in a home that’s not always Instagrammable. However, the panel agreed that should not discount your space from feeling beautiful. “It could be your bedroom, your living room, your kitchen. No matter the space, make sure you feel beautiful in it,” said Sophie. If you’re looking to do an entire home redesign, she also suggested starting with the room where you spend the most time. Focus your energy and inspiration into where you and your family gravitate. Panelists from left to right: Alexandra Kaehler, Sue Kim, Janel Laban, Deb Sonzo and moderator Sophie Donelson. Thank you to all who made the event possible, especially our partners from House Beautiful and Valspar. And to gourmet cotton candy purveyor Spin-Spun who supplied tasty flavors like Lemongrass, Blueberry and Apple Pie (all which could make great paint names), and thanks to The Broken Shaker for serving up handcrafted drinks and Pure Kitchen for some serious snacks. Be sure to join us for our next event! Searching for more color inspiration? Learn more about the Room & Board paint collection. Sophie was featured on a WCIU-TV segment the following morning!